syrup and mash roughly with a fork. Mix in the coconut milk. 2. Pour into a freezerproof container. Freeze for 1 hour then beat to break up the ice. Return to the freezer and repeat twice more, then leave to freeze completely. Remove 20-25 minutes before serving. 3. Warm a frying pan over a medium heat. Use a peeler to make shavings from the coconut chunks and cook for 3-5 minutes, stirring often, until golden. 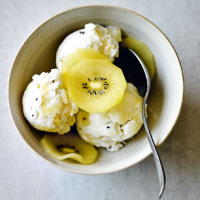 Serve sprinkled over the ice cream with extra slices of kiwi to decorate.